The law, signed by Russian President Vladimir Putin in June, makes “propaganda of nontraditional sexual relations among minors” illegal. Its passage has provoked an international outcry and calls for a boycott of the Winter Olympics to be held next year in Sochi. The hockey players made their remarks during a news conference to kick off Canada's Olympic training camp, the Calgary Herald reported. “For me growing up in Canada, my view has always been that way. I think that everyone has an equal right to play and I think we've been supportive of that. 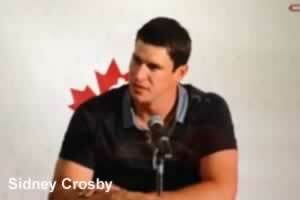 With the Olympics and the controversy around that I think those decisions and those laws aren't necessarily something that I agree with personally,” Crosby said. Bob Nicholson, president and CEO of Hockey Canada, agreed. “The players have the right to speak out as they feel and we've been in constant communication with the Canadian Olympic Committee and totally support the stance they're making,” he said.